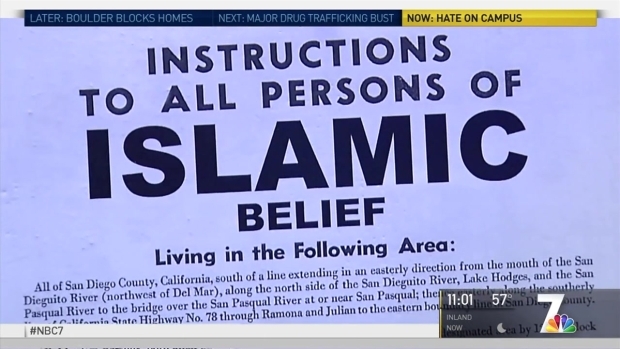 The University of California, San Diego student behind the controversial Japanese internment-style fliers calling for the removal of Muslims in San Diego County told NBC 7 that the entire incident was a big misunderstanding. The student, who wished to remain anonymous, claimed responsibility for the posters, which follows the same formatting of Internment Notices that signaled the roundup of thousands of Japanese Americans during World War II. The posters were uncovered Wednesday night in at least two residential halls. The student told NBC 7 that he is Japanese-American, a key piece of context that got lost in the stunt. His grandparents were forced to live in one of the 10 internment camps that were built because he believes not enough people voiced opposition. Students were outraged Wednesday after several posters were placed on the UC San Diego campus suggesting internment for Muslims. NBC 7 received information from someone claiming responsibilty who admitted the posters were meant to shock and anger residents. NBC 7's Dave Summers reports. He said the fliers were in no way anti-Muslim and were intended to serve as a warning for what could happen under the new administration, noting that he wanted to start a conversation about Muslims in America. "Actually, I do kind of find the extent to which people are angry kind of comforting, because it means they care," the student said. "And it means that history probably won't be repeated, but again, this went farther than I wanted it to." He said most people saw the posters and had an immediate reaction, but many missed the red writing at the bottom: messages of solidarity from the Japanese. The UCSD Triton Newspaper first alerted NBC 7 to the story. The posters caused quite a stir inside Argo Hall, a residential hall in Revelle College. "All Muslim persons, both alien and non-alien, will be evacuated from the above designated area by 12:00 o'clock noon Wednesday, April 8, 2017. No Muslim person will be permitted to enter or leave the above described area after 8:00 a.m., Thursday, April 2, 2017, without obtaining special permission from the Provost Marshal at the Civil Control Station..."
Students who spoke to NBC 7 on Thursday said they were initially outraged at the fliers and the tone it took about the Japanese internment. One student, Kalpa Semasinghe, said the poster made him feel "disgusted." When Semasinghe read the red print at the bottom, and learned that a Japanese-American had posted the sign, he said his attitude changed. The President of the Muslim Student Association on campus said that he felt "a lot more calm" about the posters once he understood the creator's intention. "Now I understand that the person who posted it did it with good intent," Tarek Gouda, president of the Muslim Student Association said. "I do think there could have been more communication maybe with the Muslim and Japanese students on campus." UC San Diego has a history of racial unrest. In 2010, the Compton Cookout party that mocked Black History month drew backlash and sparked protests on campus. In two other incidents in the following weeks, a noose was found hanging in a campus library and a KKK-style hood was placed on a statue outside the main campus library. The incident comes amid a spike of hate crimes and other hate-related cases in the U.S. in recent months. According to the Southern Poverty Law Center, the number of hate groups rose from 892 in 2015 to 917 in 2016. The number of anti-Muslim hate groups saw the greatest rise, increasing to 101 from 34 in 2015, according to the annual census of hate groups by the SPLC. The increase in anti-Muslim hate crimes coincided with the increase of these hate groups, the report said. The student behind the posters said overall, he thinks the fliers were a failure, but told me one of the goals of the project was to get people fired up. He just did not account for how fired up they would actually be.